You might be wondering… How did a heavy duty military vehicle end up as one of the best Gold Coast attractions? Aquaduck’s original name is the LARC-V (Lighter Amphibious Resupply Cargo, 5 ton). 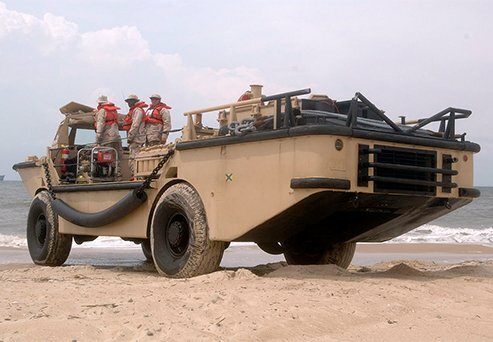 A vehicle that can effortlessly go from driving on land to floating in water is pretty cool, and the story of how this military vehicle ended up as one of the most fun attractions in Queensland is pretty cool too. Developed and built in America in the 1950’s, the LARC-V is capable of carrying up to 5 tons of weight. It’s aluminium hulled and amphibious. This means that it can drive around on the street like a car or bus, and then drive straight into water and float like a boat. The LARC-V is approximately 10m long, 3m wide (since modified to 2.5m) and 3m tall, and weighs 8,600kgs! It can reach a speed of 48 km/h on land and 15.3 km/h (or 7.5 knots) on water. LARC-Vs were originally built with a Cummings diesel V8 (220kW/300HP) engine, but the Aquaduck you can ride on today, has a Cummings diesel Straight 6 Turbo (220kW/300HP) engine. Not just anyone can take the Aquaduck for a spin. Being an amphibious vessel means that to drive an Aquaduck in Queensland, the driver needs to have a Medium Rigid Motor License and a Coxswains License, as well as a Driver Authority showing a clean record with police in all states of Australia. So when you join us on a tour, you know our qualified and professional drivers will keep you safe. Approximately 968 LARC-Vs were originally made and 500 have since been destroyed, mainly in Vietnam conflicts or just left behind after the war. About 200 are still used by the U.S. Military and another 100 are privately owned, like the Aquaduck. Thankfully nowadays we have less military activity requiring the use of the LARC’s and you are more likely to see them in a science documentary. The amphibious nature of the LARC vehicles makes it ideal for scientists in Antarctica who need to travel across the icy earth and through the Antarctic waters to conduct their research. We believe It’s the perfect vessel for exploring the extensive waterways, the Broadwater and the canals of the Gold Coast. 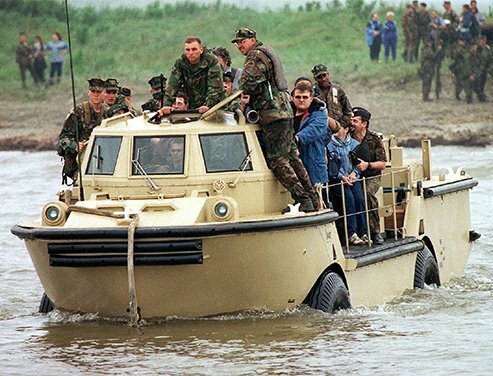 The conversion process, modifying the vessel into the 30 passenger plus crew duck bus you see today, cost over half a million dollars. The first Aquaduck tour took place in 1996 and we have been proud to maintain and operate these amazing amphibious vehicle in the interest of showing off one of the most beautiful areas of Queensland ever since. Book your seat on the Gold Coasts most unique city and waterways tour today.